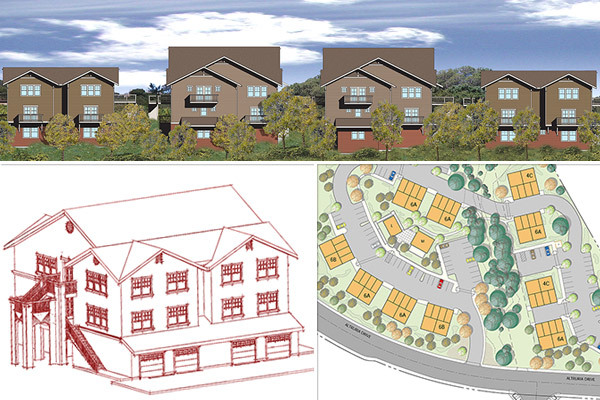 The proposed Altruria Housing project was a 60 unit condominium project on 12 acres of steep hillside in east Santa Rosa. The buildable area of the site was severely constrained by the number of oak trees, a large riparian easement and steep slopes that were rendered unusable by a local hillside zoning ordinance. Parking was intended to be provided by a combination of garages, carports and uncovered spaces. The split level buildings were two- and three-stories in height and stepped down the hillside to avoid extensive grading. The project was split into two halves divided by the heavily wooded riparian corridor. Site plans with and without a pedestrian and vehicular bridge across that corridor were studied and presented to the client.